But there are a few countries that I never even see records from, much less find… Laos was one of them. The surrounding countries of Cambodia, Thailand and Vietnam had vibrant music scenes… Why not Laos? Well, it might have had something to do with all those bombs the U. S. Armed Forces were dropping on their country (more than all of the bombs dropped during World War II), and the North Vietnamese Army invading from next door. When I found this record, I thought it was most likely from Thailand, but I was not entirely sure… So I scanned it in, and e-mailed it to my friend Wanchai ‘Guy’ Udayachalerm. He e-mailed me back and told me that it was not in Thai, but in Lao and that the only thing he could make out was “Made in Laos”. The only information I have is what a previous owner wrote on the back of the record. So, I am not 100% positive that the artist’s name is ‘Chanthara Outansakda’. Catalog number No. 007 on No other information available. Since this posting, I have been contacted by Chanthara Outhensackda. He was head of the studio for Lao National Radio from 1968 to 1975 in Vientiane. 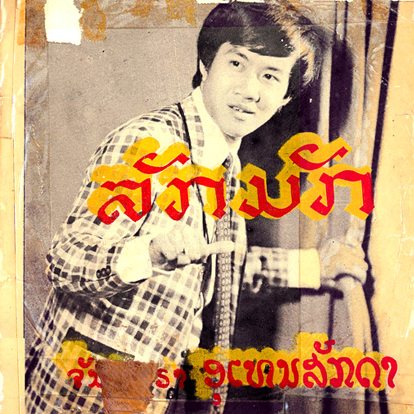 He recorded all of his songs in Laos – not in Thailand as some people have speculated. He currently lives in France. Also, the song was originally posted as ‘Love You Lonely’, but has since been corrected. Thank you for posting the above original Lao classic music. I would love to see more of them on your website. I have in my possession a few Lao original vinyls, but most them are damaged. I’d contribute the ones still in good shape to your website.